Williams publication # 16P-497-100 for use with electronic solid-state (SS) Williams pinball and shuffle bolwer games made between approx. 1977-1984. This shop repair manual covers most circuit boards and diagnostic procedures in these games. 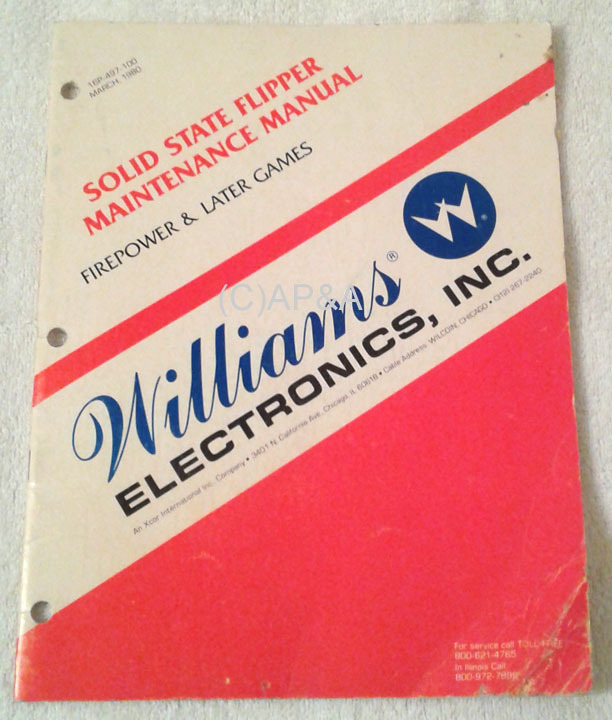 This manual covers Firepower pinball, and all earlier (previous) pinballs back to Hot Tip in 1977, but can be used for most procedures in newer games up until about 1984 also. Used original manual in good condition. Some used manuals may have various signs of past use including scuffs, scrapes, stains, and some handwriting on/in them. E-mail for details before ordering if you need to verify condition. IMAGE ABOVE IS SAMPLE ONLY- actual manual may vary in appearance. Factory part # 16P-497-100.